I'm now volunteering once a week at my kids' high school in the Career Center. So far I've discovered that there are few things more interesting than teenagers. I don't envy the balance they have to reach between conformity and individuality. Not that the pressure for that ever completely goes away, but it definitely peaks during those years. One thing I noticed recently was a lot of girls with a kind of hobo-style cross-body bag. The funny thing is, I made one of these for my daughter and one for a friend's daughter this summer, without realizing they were actually popular. I feel so hip right now. Don't tell any of the kids I said that. 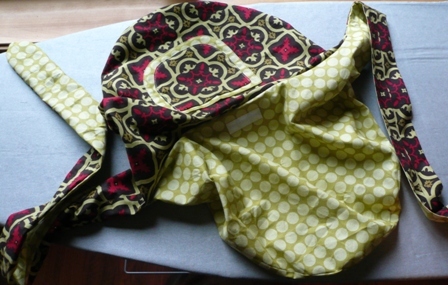 The first one I made was from a fabric with monkeys practicing karate on it, thus the name Ninja Monkey Bag was born. I know you were wondering. The one I'm showing you today is my first completed item for my newly open and stocked ETSY STORE!!! Cut 2 of purse pieces from outer fabric and two from lining. Cut one inside pocket from outer fabric. Cut one large outside pocket from lining fabric. Cut one small outside pocket from outer fabric, centering on a point of interest in the fabric. Iron a 10" by 7" piece of interfacing to wrong side of back lining piece, centered behind pocket area. Iron second piece of interfacing to wrong side of front body piece, centered behind pocket area. Attach a 2 inch square piece of heavy interfacing or fabric using fusible web centered and about ½ inch from upper edge on both lining pieces to support Velcro. Fold all pocket pieces right side together and sew each ¼ inch from raw edge, leaving about 2 inches open for turning. Clip corners and curves. Turn right side out. Press. Center small outside pocket on top of large pocket. Stitch around sides and bottom of small pocket, close to edge. Pin front pocket to outside of front outer piece, centering side to side and 2 ½ from top edge. Stitch around sides and bottom, close to edge. Pin inside pocket to back lining piece, centered and 3 inches from upper edge. Stitch around sides and bottom close to edge. Stitch from top edge to bottom 3 ½ inches from left edge to create two pockets. Sew on Velcro, centered with top edge 1" from top edge of purse, on right side of both lining pieces. Lay lining pieces right sides together. Pin. Stitch around outer edge to tops of straps. You're basically sewing an elongated "U" shape. Repeat same with outer pieces. Press seams open. Turn lining right side out. Stuff inside purse, right sides together, lining up all edges, and pin. Stitch around all raw edges, leaving 4 inches open for turning. This is where you're sewing the inner part of the "U" shape I mentioned before. 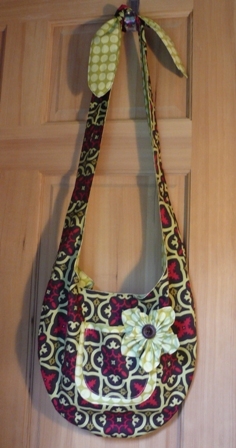 Turn purse through opening, turning long straps out to a point. Push lining into purse. Press. Topstitch around edge. Sew on a flower, using instructions from last week's More Fabric Flowers post, by stitching through a 1" button on front and a button inside for support. 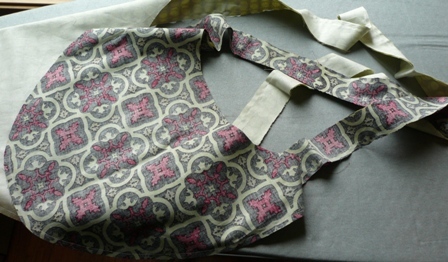 Tie straps to make purse desired length. Imagine all the possibilities for fabric and color combinations!